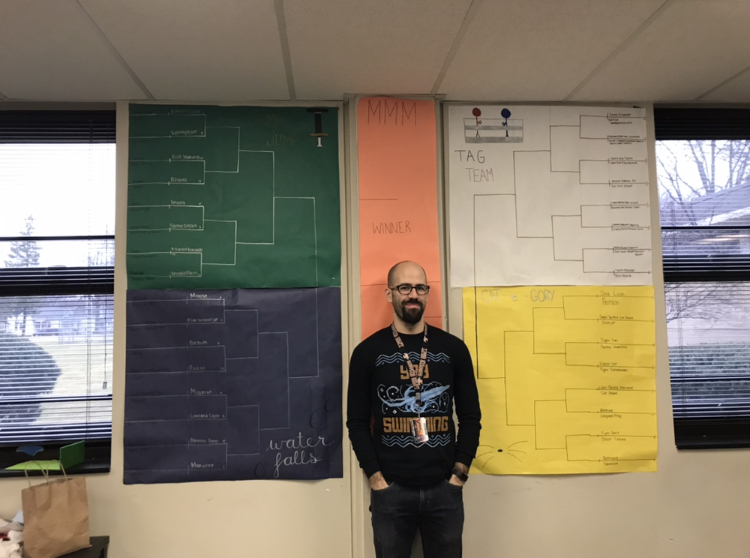 This March, Biology teacher Mr. Doty has been holding the 3rd annual March Mammal Madness tournament at LaPorte High School. The tournament puts a twist on the basketball version of March Madness. Instead of basketball players dribbling up and down the court, this tournament pits mammal against mammal in a competition to see who would win in a fight to the death. The tournament does have some similarities to NCAA’s March Madness. Like the NCAA tournament, the March Mammal Madness starts with 64 participants and dwindles down until there are only two brave competitors left that fight for the championship title. In addition, both tournaments have a higher and lower seed, with the higher seeded animal given higher odds to win each matchup. “Scientists give each animal a score and then rank them, then they put those odds in a random number generator, and then the scientists write a story, based on science, to explain the outcome of the fight,” Doty said. Also resembling the NCAA tournament, March Mammal Madness gives rewards to someone who is able to fill out the best bracket. This year, Doty will be giving out a 3-D printed trophy to the person who filled out the bracket with the most correct selections. Doty will also be giving out extra credit if the winner is in his class. “I got two trophies, a small one for being top in the class, and a large one that Mr. Doty made for top in the school,” last year’s winner, sophomore Nevaeh Mendoza, said. What brings people back to March Mammal Madness every year is the competitive nature of the tournament. Students may enjoy seeing what it would be like if a lion went up against a rhinoceros for example. “I just like the competitiveness of it. It’s just fun to compete with others, and it gives you something to talk about with people maybe you don’t usually talk to,” freshman Nick Shuble said. As for the favorite to win in this year’s tournament, many people- including Shuble and Mendoza-have chosen the Bengal Tiger; Doty, despite this, has a different opinion. “My head thinks the moose is going to win, but in my heart I want the water opossum to win. I know it’s going to lose, but I’m hoping somehow it’s going to pull it out,” Doty said. According to Doty, over 2,500 people participate in the March Mammal Madness competition he oversees. Thousands of teachers signed up for the event with an estimated student outreach of 200,000 students. The competition is held in 35 countries with one person from each continent participating. There are even students participating in Australia, Kenya, and Colombia! The tournament will be updated once or twice a week up until the first week of April. The March Mammal Madness championship will be held on April 3rd.